« Is RunKeeper the best? I’m likin’ it, here are the reasons. You can track mileage of your gears (shoes and bikes) just look down on your feet and pick what you see when you start a run. It pairs with ANT+ HRM and footpod as I don’t have a ANT+ dongle so I can’t tell how good they are yet. Under the “Advance Setting” you have AutoPause where you can set a time between 0-60 seconds. With this you don’t have to take your phone from your pouch when you stop for water or road crossing, the app does it for you automatically. 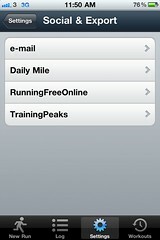 Garmin has it but RunKeeper doesn’t. There is one minor glitch, whenever I start a run it cues me that I have paused my run. The default setting is 10 seconds I certainly didn’t wait that long before stepping out. iSmoothRun pledges “you own your data” so when you’re done with your workout you can email it to yourself or upload directly to online communities. 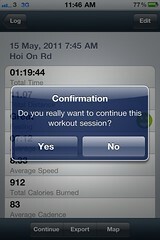 For now I upload my workouts to RunKeeper. I love audio cues ever since I tried Adidas miCoach. iSmoothRun lets you have choices of time or distance. I normally pick 0.5k but they don’t have it, perhaps 400m is best for those who run on sports-ground tracks. I picked 5 minutes for couple of runs it’s weird to hear “…. you have done 6.11k …!”. 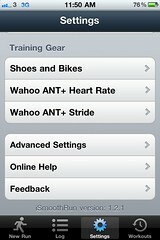 You could turn on cues for Pace, Cadence, Distance, Time and Heart Rate (if you have ANT+). The cue for Cadence is nice the app uses the accelerometer of the iPhone as you bounce up and down, your phone should do the same in your waist pouch or armband. After couple of runs I see that iSmoothRun’s cadence readings are typically 2~4 less than that recorded by my Garmin 410. At the bottom of the screenshot below “Export” takes you to the page where you can either email or upload your workout to social communities. “Map” obviously shows you where you have been. I have never thought I would “Continue” with my last run? iSmoothRun differentiates itself from the crowd by saying that your workout data is stored in your phone and you own it (they don’t have their associated website to keep your data). 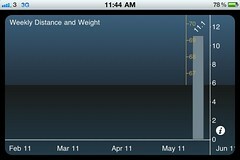 You therefore have handy charts, such as weekly mileage and your weight etc, right on your phone. 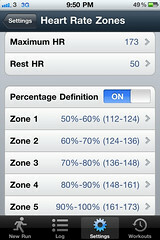 Other features which you can’t find in RunKeeper app are HR zone audio cues and custom design your own interval workouts. I’m ready to invest on a ANT+ dongle to enjoy these, too bad I don’t know of any Wahoo reseller here and the high shipping charge for that little piece of plastic isn’t justified. I have now tested this app on this and that route that I usually run on. GPS distances conformed closely to Garmin readings (Garmin isn’t all that accurate but repeatability is best so far). iSmoothRun isn’t perfect, e.g. I think it would be sensible for the app to show GPS signal level before I tap “Start your run”, the current version gives cue “GPS is ready” after I have started my run. I also wondered when GPS signal is lost, e.g. I entered a tunnel, will I get cheering cue like “… GPS signal is lost but keep going your distance is tracked by accelerometer of your phone until GPS signal is recovered. ….” or something shorter to that effect. 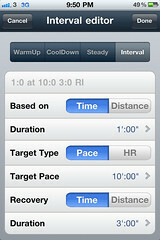 Last but least important to me is that iSmoothRun doesn’t have music selection/control. This entry was posted on	May 18, 2011 at 11:33 pm	and is filed under Uncategorized. Hi, we are glad you like our App. When entering a Tunnel, you are going hear “Switching to Accelerometers”, and when you are out under the clear sky you gonna hear “GPS on”. The reason you don’t get GPS signal before start, is because the App doesn’t use GPS when not in “recording” mode, so you can use it to see your past workouts and statistics without GPS draining power. Nevertheless you can use “Auto Pause” tap “start” wait a for the GPS bars to become 3 or 4 and the start running. The “continue” button is mainly for 3G devices where you have to quit the App to make a phone call. Wonder what I should do if I want to shot pictures in the middle of a run (recording), with AutoPause should I just minimize the app shot and put the app on the foreground again? Yep, just wait a few seconds for the App to auto pause, minimize it, bring up camera, shot the picture, and then bring the App again to the foreground. It will start recording again as soon as you start running. Can we turn off accelerometer?